The theme of the game takes you back to the wild west of America where the cowboys and Indians are at each throats! You can feel the heat of the southern Amerian plains and the see the dust of the dessert – well at least on the screen anyway! NetEnt has worked hard to produce this highly entertaining slot game. 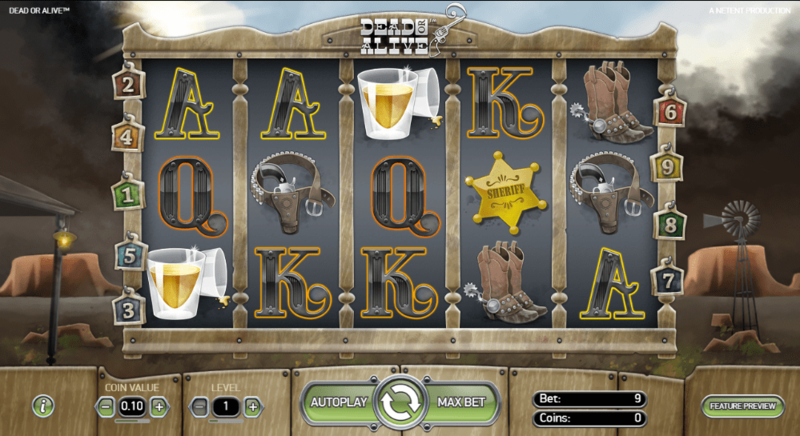 It is a 5 reel slot game with 3-row multiple coin slot features and 9 bet lines. As well as an immersive theme, there is also bonus features such as scatter wins and wild symbols. During the free spins, sticky wilds will increase chances of winning dramatically. This is a fun game that will enable you to have some great wins – it is able to be played on various platforms. Not the right game for you? Try to view online UK slots here. Netent specialises in developing mobile-friendly content that can let its users spin slot games in luxury, wherever it may be that they desire to do so. They are based in Sweden and always work hard to be a step ahead with ideas and technologies. Netent also adopts HTML5 to their slot games. Their games are compatible with a range of devices including Apple and Microsoft technologies. Because of its creative background which encompasses a western style landscape, this is recognized to be among the best-rated online slots for new players. The symbols have a lot of different elements. Firstly, the shot glasses are the lowest paying icons, followed closely by the dirty cowboy boots which appear to have seen some action. The white cowboy hat holds the middle value and comes with a pistol in a holster. The shiny golden star that is the Sheriff’s badge is the highest paying so keep a good lookout because this one is sure to put a smile on your face! Subsequently, the 10, J, Q, K and A serve as the five lowest value symbols, which works well against the graphics of the other games. The sticky wild spins expand on the ‘wanted’ poster so you can keep track of what is coming your way. Free Spins make up the one main bonus feature in Dead or Alive. They are triggered by landing on three or more crossed-pistol scatter symbols – these can appear anywhere on the reels. 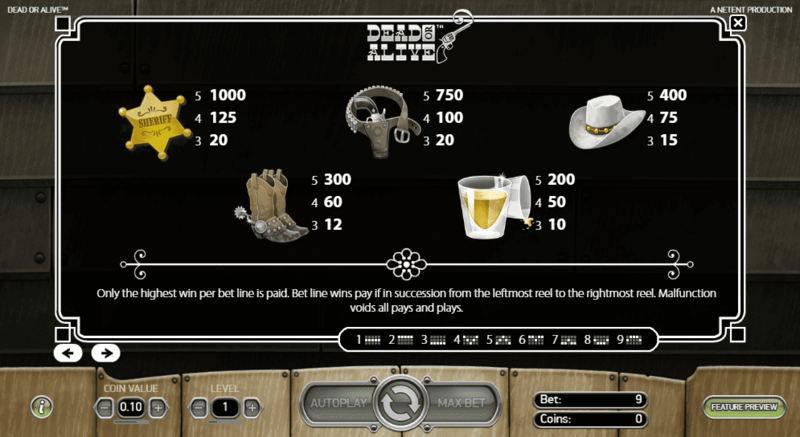 Net Entertainment has done a successful job of providing an entertaining game here that allows players to effortlessly dissolve in the Wild West. This is achieved through the control panel which is easy to interact with on the side of the reels. This allows you to keep track of the current bet and bet level. It is also useful to see the coin value and how many coins are left for you to play. There is also an autoplay feature which makes it simple to relax and the reels do their magic! So enjoy a trip down the wild west, looking out for the free spins and sticky wilds as these have the ability to dramatically increase money to players. If you liked Dead Or Alive, play Fruit Shop!